Today, at more than 7,500 events across the country and at military bases worldwide, Lights On Afterschool's tenth anniversary is being celebrated in a coordinated drive emphasizing the importance of afterschool programs for America's children, families and communities. The Empire State Building in New York City will be specially lit up, and the rarely-illuminated Lindbergh Beacon atop Los Angeles City Hall will be turned on in a display of coast-to-coast support for Lights On Afterschool's important message: all children deserve access to high-quality afterschool programs. "Learning doesn't just happen in a classroom between school bells," said U.S. Secretary of Education Arne Duncan. "Children learn all day long. So it's vital to give students and their families the tools, the facilities and the opportunity to continue working on traditional academic subjects as well as a place for broader lessons in areas like art and music to enrich their lives." To read the rest of the Department of Education's press release, click here. 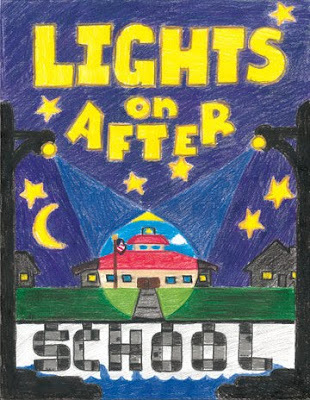 To find a Lights on Afterschool event in your neighborhood, click here. To support tutor/mentor programs throughout Chicagoland, click here. Thank you! Charles Kilpatrick is in his second year at Cabrini Connections. He was referred to our program by fellow student Savon Clark's mother, Shavonne Clark, who is an alumni of the Montgomery Ward tutoring program from which Cabrini Connections started. Before I can even finish asking Charles what he thinks of our program, he says, "I love it! ... I love bonding with my mentor [Mitch Holzrichter]. I can talk to him about anything. He makes sure that I stay on task, that I'm doing the right things, and that I keep positive." 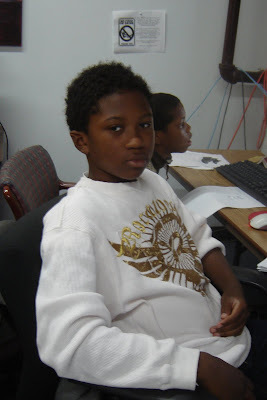 Charles is a freshman at Muchin College Prep, a campus of Noble Street Charter School, located in downtown Chicago. So far he likes his new school, but with strict rules and rigorous coursework, it can be stressful at times. His favorite class is biology and he plays the snare drum in the marching band. In fact, if there's one thing you know about Charles, it's that he loves to drum. Before tutoring starts, he can almost always be found with drumsticks in hand, quietly practicing on his legs or in the air. Charles plans to cultivate his talent by studying music in college. Right now he has his sights set on historically black universities such as Alabama State, Jackson State, Bethune-Cookman, and Clark Atlanta, but he has not ruled out Northwestern or University of Michigan, the alma maters of his mentor. Those are all great tips. Thanks for sharing! Charles currently lives in Parkside of Old Town with his mother, grandmother, and niece, and says, "everything's good." We're glad to hear that, Charles. You have a bright future! Keep working hard. Mitch Holzrichter, originally from Geneva, IL, a western suburb of Chicago, graduated from Northwestern University in 2005 with degrees in Political Science and Economics. Because he had earned so much college credit in high school, he was able to graduate from Northwestern in just three years. This enabled him to spend his senior year as an intern in Washington, D.C., working on transportation policy for the Speaker of the House of Representatives Dennis Hastert, with whom he had interned twice prior. Mitch later attended The University of Michigan Law School and in July of 2008 he passed the bar examination (a test to determine whether a candidate is qualified to practice law). He is now an attorney at Mayer Brown LLP, a leading global law firm with offices in key business centers across the Americas, Asia and Europe. They have 1800 lawyers worldwide, approximately 500 of which are in Chicago. Mitch works as a transactional attorney in the practice area of government. His job is to negotiate a deal between two entities, one of which is the government; document that deal; and legislate if necessary (go to the government for approval via laws, resolutions, ordinances, etc.). Mitch likes his job a lot because he has always had an interest in government and politics. But it turns out he was able to cultivate two interests at The University of Michigan - law and love. Mitch met his fiance, fellow Cabrini Connections mentor Carolyn Grunst, in law school. They will be getting married on October 2nd, 2010. We wish them all the best. Congratulations! Carolyn is actually the one who brought Mitch to Cabrini Connections after she discovered our program on the Internet. They live in the area and wanted to volunteer in their own neighborhood, so our program was a perfect fit. They signed up as a 2-on-2 and were matched with 8th graders Charles Kilpatrick and Malina Tate. Mitch and Carolyn subsequently went through the high school applications process with them, and now, a year later, Charles and Malina are freshman at Muchin College Prep, a campus of Noble Street Charter School, located in the heart of Chicago at 1 N. State Street. Mitch has spent all but one year of his life in the Chicagoland area, so we expect him to be around for awhile. "It's probably the most well-rounded city in the country," he says. "It's a good place to have a career; it has a diverse economy; and it has the lakefront" - all great things! Thanks for joining our team, Mitch. You're one of our star players! Ana Tate is an 8th grader at Ruben Salazar, where she was recently recognized as Student of the Month. She was nominated by her teacher for doing all of her homework, staying on track, and coming to Cabrini Connections. Now it's time for us to put her in the spotlight! Ana is in her second year at Cabrini Connections. She heard about our program from her sister, Malina Tate, who had signed up just a month prior. They now both attend on Wednesday nights - the same night as Ana's best friends, Arden Harris and Ayana Martin - making it a fun-filled evening for them all. They often show up early (right after school) in order to take advantage of our space. They use computers and play games for a few hours before tutoring starts. In fact, all of our students are welcome to come early, and Ana and her friends are a great example of the benefits of that. Ana's favorite subjects are reading and science. She is in the reading club at her school and her favorite place in all of Chicago is the Harold Washington Library Center, located downtown on State Street. How great is it to see a student who loves reading?! Ana will be entering high school next year and would like to attend Whitney Young or Kenwood Academy. In the long run, she wants to be a veterinarian. "My passion for animals is deep," she says. She has a kitten named Sweetie, a turtle named Danny, and her favorite animal is the dolphin. No matter what field she goes into, Ana wants to be successful so that she can keep her family safe. We commend her on looking out for them. You're going to make it, Ana! Keep up the good work! 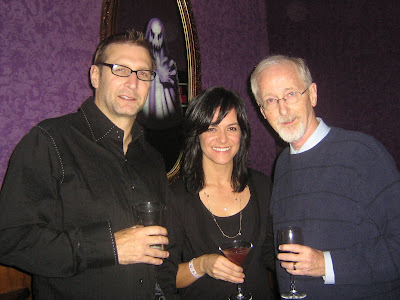 Bill Blasko (picture to the left, above, at last week's Martini Madness fundraiser) was born in Milwaukee, Wisconsin, but spent the bulk of his adolescence growing up in Saginaw, Michigan, a few hours north of Detroit. He graduated from Michigan Technological University in 1989 with a degree in engineering and later went on to earn a master's degree in Business Administration from DePaul University in 2003. Bill lives in the Wicker Park neighborhood of Chicago with his two dogs, a 175-pound English Mastiff (wow!) and a 90-pound English Labrador. He likes to hang out with his friends and watch sports, as he is an avid participant in fantasy football leagues. He has also been known to play guitar and paint, although he admits to being out of practice in both interests. Bill is single at the moment, but, though he's unsure of what the future may hold for him, he does hope to start a family one day. Bill found out about Cabrini Connections via a simple web search. (If you Google, "mentoring Chicago," we're on the first page.) He wanted to give back to the community and he felt like tutoring and mentoring was a good way to make himself and someone else feel good. So he signed up in August and almost immediately got paired with Darren Forest, a 5th-year veteran in our program. Whether they work solely on Darren's homework or they have time to just talk about life, Bill says that he always walks out of Cabrini Connections feeling good. Well, we feel good, too, Bill! Thanks for joining our team! We look forward to your presence for a long time to come. CPS students did not have school on Monday (Columbus Day), so some of them chose to go to college instead! Yesterday I had the pleasure of leading 10 students from Cabrini Connections on a field trip to DePaul University in the Lincoln Park neighborhood of Chicago. This trip, like the one to Northwestern in September, is part of our College Application Assistance Program (a.k.a. the "College Zone"). Each one of our students meets with a College Zone Coordinator at least once per quarter to discuss post-secondary plans. 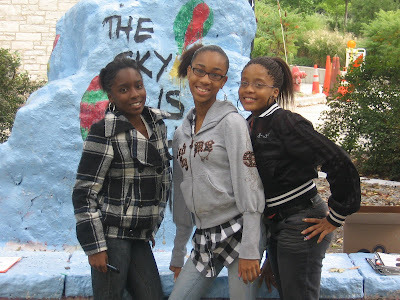 Though, for some, college is many years away, they are learning about what it takes to get into college - they begin to understand what kind of GPA they need to maintain, what kind of ACT score they should shoot for, and how much scholarship money they may need. 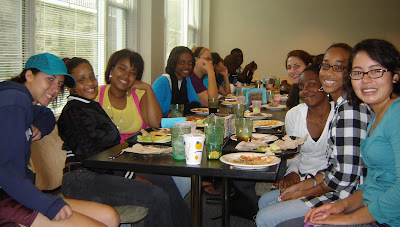 Our visit to DePaul began in the school's Student Center. Chartwells Dining Services was kind enough to treat our students to free lunch in the Center's Cafeteria, which features several different made-to-order food stations. Needless to say, they came away happy. Special thanks to Stephanie Moye for her help! After lunch it was time for an information session followed by a campus tour. DePaul is known as one of the best schools in Chicago and it certainly showed. DePaul has more than 15,000 undergraduate students, nearly 250 student organizations, and its athletics compete in the BIG EAST conference. The average high school GPA of admitted students is 3.5 on a 4.0 scale and their average ACT Composite is between 22 and 27 (middle 50% score range). Also, in 2009, the Princeton Review ranked DePaul No. 10 in the Diverse Student Population category, making the sixth consecutive year that DePaul has been ranked in the nation's top 20. Our campus tour took us from the Student Center, to the Academic Center, inside a dormitory (left), through The DePaul Quad, to the library, and, finally, to the Fitness and Recreation Center. As I walked around, it was great to hear some of the students who went on the Northwestern trip comparing the two universities (e.g. the sample dorm was nicer and larger at DePaul, but Northwestern has a more spacious campus). This is part of the goal for these trips: to answer the questions, what does college look like, and, most importantly, what does your college look like? Where do you imagine yourself going to school? So it isn't necessarily about visiting DePaul per se. It's about visiting college, of which DePaul is an easily accessible example. Thank you for welcoming us, DePaul! I look forward to seeing some of our students becomes yours! Native Chicagoan Rajul Shah has been volunteering with Cabrini Connections since January of this year. He was introduced to our program by his wife, veteran volunteer Molly Shah. Rajul and Molly met in college at Rice University in Houston, Texas, where Rajul studied economics. After college, he and Molly moved to Washington, D.C., for four years, before returing to Chicago in 2006. Coincidentally, their parents live just 15 minutes away from each other in the Chicagoland area, making the decision to move back an even easier one. Rajul used to work serious hours (80 per week!) for a private equity firm; however, he got tired of the corporate world and decided to go into a brief retirement. Thus, since October, Rajul has been simply "livin' the good life." He likes to play sports such as baseball, golf, basketball, and tennis. He also likes to travel. Rajul has been to India, Japan, Indonesia, New Zealand, all over Europe, the Caribbean, and to Bora Bora for his honeymoon. In college, he studied abroad in Austrailia and this fall he is taking some of his friends to Puerto Rico for his birthday. He's a regular globetrotter! Rajul doesn't plan to stay retired forever, though. He would like to start his own business offering advisory services to smaller corporations trying to make it in the larger corporate world. "I just want to do my own things," he says, which is great. Rajul is proof that you can "do your own thing" one day, but it takes a lot of time and hard work to earn that opportunity. 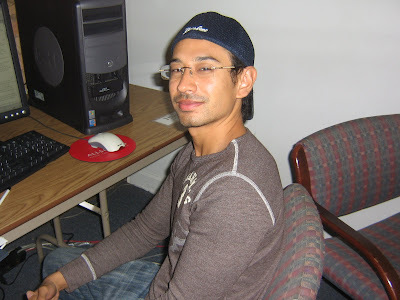 Someone who's already starting to see the value of hard work is Josue Roque, Rajul's mentee. Josue, currently an 8th grader at Ruben Salazar, is working to get into a top Chicago high school like Whitney Young, Lane Tech, or Jones College Prep. He and Rajul will be meeting in the College Zone to prepare him for the selective enrollment examination in December. That's right; our College Zone helps with high school admissions, too! Rajul and Josue met several times over the summer to have lunch and catch up. Josue appreciates having an outside perspective - a mentor - to talk to. Rajul facilitated their open relationship by himself being very open when they first met. Now they get along really well... and Josue always brings his homework. Rajul had him calculate how many points he could accumulate over the next six years and it translated to hundreds of dollars! But while money was the initial incentive, now it's just a habit. Great idea, Rajul! Congratulations on being in the spotlight! We appreciate your commitment to the program! 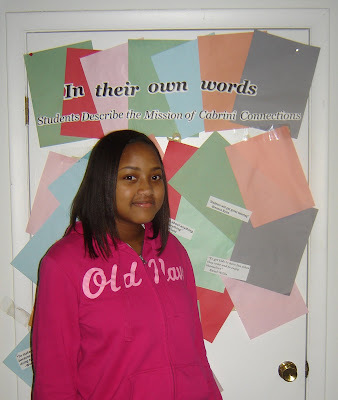 Jocelyn Jones, a resident of Humboldt Park, is a 7th grader at Newberry Academy. 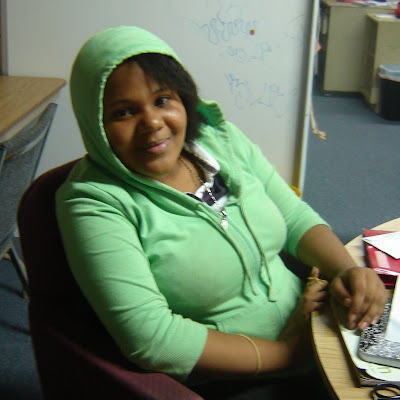 She came to Cabrini Connections from Cabrini Green Tutoring Program, our sister program in Lincoln Park that provides after-school tutoring to 1st-6th graders. Jocelyn likes our program because you can come every day... and she almost does! She's here on Monday night for Art Club, Wednesday night for Writing Club, and Thursday night for one-on-one tutoring and mentoring. In Art Club, Jocelyn has been using watercolors to create pictures of Chicago; in Writing Club she has been working on vision boards for our 2009-2010 theme (Hope, Build, Believe, and Achieve); and at tutoring she has been getting to know her new mentor, Angie Berthelsen. Jocelyn's favorite subjects in school are math and social studies. In social studies she has been learning about U.S. expansionism, including the Louisiana Purchase and the Texas Annexation. Jocelyn plays basketball, soccer, and is on student council at Newberry Academy. As she approaches the end of elementary school, Jocelyn has her sights set on admittance to one of Chicago's top high schools, such as Whitney Young, Walter Payton, Jones, Lane Tech, or Lincoln Park. But she's not stopping there. For college, Jocelyn would like to go to DePaul, Northwestern, UIC, or Loyola. After that it may be on to medical school. Jocelyn wants to be a doctor when she grows up; either a veterinarian or a pediatrician. She also dreams of being a fashion designer. Jocelyn likes to travel, too. She has been to California and Las Vegas to visit her family, but she would love to go to some place overseas, like Tokyo or Hong Kong. Perhaps a study abroad program in college will make her dreams come true! In whatever Jocelyn decides to do, we know that she will be successful. We look forward to being a part of that success over the next six years and beyond. Congratulations on being in the spotlight, Jocelyn! 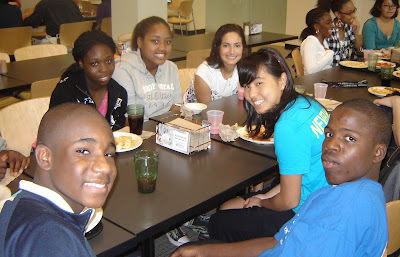 Congratulations to the following six students who were elected to the 2009-2010 Youth Leadership Council! The Youth Leadership Council will meet biweekly to discuss policies and procedures at Cabrini Connections. The Council may influence field trip destinations, the tutoring schedule, the points system, and more. They will also devise strategies to increase youth involvement and attendance (particularly in Winter months). I'm eager to see what they come up with! Last Friday, EL Da' Sheon and I escorted 10 students from Cabrini Connections to Northwestern University for a college visit! As part of our College Application Assistance Program - better known in our center as the College Zone - we offer free trips to Chicago-area colleges. In the past we have visited places like DePaul University, Illinois Institute of Technology, and Westwood College, however, this visit held special significance. I am the third NUPIP Fellow at Cabrini Connections; EL Da' Sheon went to Northwestern; and we have 12 mentors who are alumni of Northwestern. All of us cherish our time spent at NU, so it was an honor to share the Evanston Campus with prospective students from our program. Our visit started at Allison Hall dining room where Sodexo food services was kind enough to allow us free entry! The environment was both exciting and overwhelming, with NU students everywhere and countless food options to choose from. Our students gradually got the hang of it, though, and soon their trays were piled high with fresh food. We sat down to eat with students from Promote 360, a student group in the School of Education and Social Policy that empowers and supports minority students. It truly was a humbling moment to see so many of my friends turn out. Thank you for supporting what I do; and special thanks to my friend Candise Hill for organizing the P360 group, to ASG President Mike McGee for attending, and to Ms. Doris Timmen from Sodexo for welcoming us with open arms! Lunch was the highlight of our trip and it wouldn't have been possible without your fantastic hospitality. After lunch, we headed to the Office of Undergraduate Admission for an information session and campus tour. We learned about the university, its six undergraduate schools, student life, the application process and financial aid. It was a beautiful day for a tour and our stroll took us through The Arch, by The Rock, and into Norris University Center. Lamont Morris, born and raised in Chicago, is a 7th grader at Alain Locke Charter Academy, located in East Garfield Park on the West Side. Lamont enjoys learning about our past, which is why his favorite subject is history. He recently learned about hieroglyphics - ancient Egyptian characters made by graphical figures - and was fascinated. Lamont's most challenging subject is math. In fact, part of the reason why he enrolled in Cabrini Connections is to get help with his math. He is a good mentor. He gives good advice when I have problems... He says, "Think of what would happen if you do this... The decisions you make are as important as the ones you don't make." 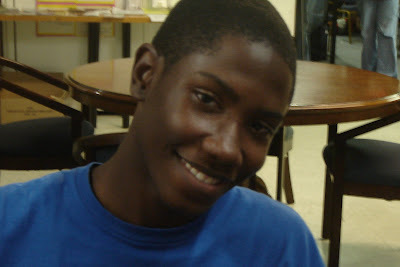 Lamont is a very active young man, taking part in football, baseball, and boxing. His favorite boxer is undefeated welterweight champion Floyd Mayweather, Jr., and his favorite football player is Chicago Bears wide receiver and return specialist Devin Hester. His favorite person is an athlete, too: Magic Johnson. Lamont dreams of attending his alma mater, Michigan State University. He says he looks up to the athletes he does because of how they grew up. They had it hard, never gave up, and kept their heads up. The mind is a wonderful thing. Don't waste it. Thanks, Lamont! You're setting a good example for your peers. Keep up the good work! Jeroz Owens grew up in the south suburbs of Chicago. In 2007, he received a Bachelor's Degree in Accountancy from the University of Notre Dame and in 2008 he received a Master's Degree in Accountancy from the University of Georgia. Accountants maintain and prepare financial records and reports for businesses and individuals. Jeroz works in Enterprise Risk Services (ERS) at Deloitte, one of the largest professional services organizations in the world. ERS consultants help clients manage risk and uncertainty. 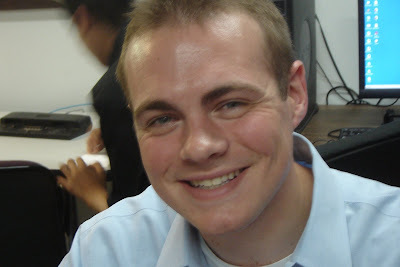 Jeroz has worked at Deloitte for 14 months and is currently studying for the Certified Public Accounting (CPA) Exam. As you can tell, Jeroz has put in a lot of hard work to get where he is today. He is very dedicated and always sets goals. "Where do I see myself in 5, 10, 20 years?" he asks. Jeroz might go into the real estate business and he might move to Atlanta, but for now he is happy living and working in Chicago where he can closely follow his favorite sports teams, the Bulls and the Cubs. Thanks, Jeroz! .. and congratulations on being in the spotlight!